Placing troops and weaponry on Russia’s border will only heighten tensions in the region. NATO defense ministers, meeting in Brussels this week, rushed headlong into a new and potentially more dangerous cold war with Russia by taking the unprecedented decision to station men and matériel directly on Russia’s western border. NATO’s decision, which has no precedent in the history of the last cold war, will only serve to heighten tensions with Russia and may well be the catalyst for ever more violence in the breakaway regions of eastern Ukraine. Meanwhile, transatlantic efforts to undermine last February’s Minsk II cease-fire accords continue without surcease. On Monday, June 22, the European Union extended sanctions against Russia in the financial, energy, technological, and defense sectors until January 2016. The decision was made at the EU’s foreign ministers meeting in Luxembourg. Russia quickly retaliated, banning food imports from the EU, the United States, Canada, Norway, and Australia for the next 12 months. Yet ditching the “playbook” obviously didn’t entail jettisoning Cold War–style rhetoric, since Carter went on to denounce Russian President Vladimir Putin as a “malign influence” in Eastern Europe. Later in the week Secretary Carter participated in the NATO defense ministers’ meeting in Brussels. And the summit’s—please forgive the bureaucratese—“deliverables” indicate that the alliance has taken Carter’s directive to heart, with plans to triple the number of troops in its Response Force to 40,000 troops. 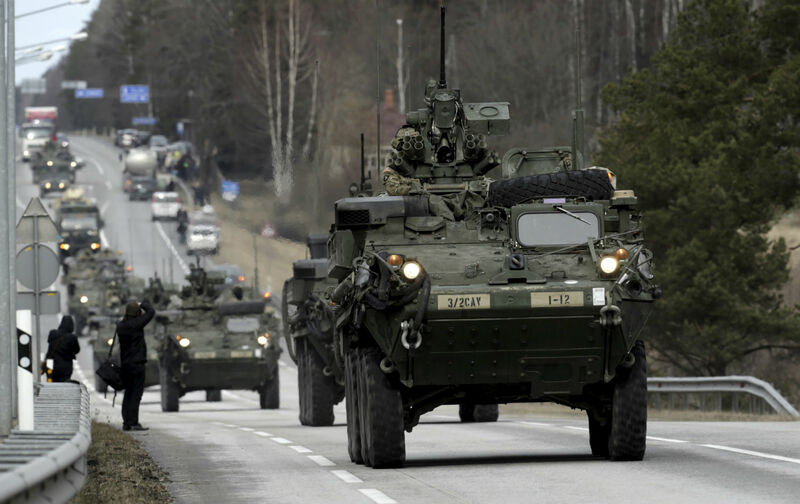 Troops, armored vehicles and up to 250 tanks will be stationed across Europe’s eastern frontier, with plans to station them in Bulgaria, Estonia, Latvia, Lithuania, Poland, and Romania. Taking this perhaps fateful step is, in fact, going far beyond the “Cold War playbook” and has no parallel in Cold War history. These maneuvers precede what will be NATO’s largest joint exercise of the post–Cold War era, Trident Juncture 2015, which is planned to take place September 28 to November 6. More worrying still is the fact that the NATO meeting took place amidst a rash of nuclear posturing from both sides. On June 16, President Putin made headlines throughout the West when he announced that Russia would add 40 additional intercontinental ballistic missiles to its nuclear deterrent. His announcement was, in turn, denounced in short order by Secretaries Kerry and Carter as well as by NATO Secretary General Jens Stoltenberg. Nevertheless, all the Sturm und Drang over the sanctions, NATO troop buildups, and nuclear saber rattling masks the uncomfortable fact that it is our clients in Kiev who are acting as the primary—though, of course, not only—obstacles to implementing Minsk II. In Brussels, NATO signally failed to address Kiev’s ongoing economic and financial blockade of the Donbas region of eastern Ukraine, its firing of GRAD rockets into crowded residential blocks in eastern Ukrainian cities, and its refusal to negotiate with the rebel leaders as stipulated by the Minsk accords. Meanwhile, President Obama is said to continue to insist that it is the Russian-separatist side alone that is refusing to implement the accords. And so the events of this week have extinguished any glimmer of hope that may have been sparked by John Kerry’s diplomatic parley with the Russians in Sochi this past May. All the while, the administration, aided and abetted by a compliant Congress and a complacent media, stands idly by as the war parties on both sides of the Atlantic march on, unencumbered and virtually unopposed. For more about an organization dedicated to opposing this rush toward a new Cold War please visit EastWestAccord.com.